The Metropolitan Circus in Budapest will highlight the mood on the night with its Circus Maximus show. A gladiator among 5 tigers, elephants and an adorable clown trainer, beautiful rubber girls, air acrobats and the Khadgaa group will step on stage. At 11 p.m. the Hungaricum Orpheum vaudeville comedians, dancers, music and song will entertain the audience. Just a hint of what is to come … a bunch of world-wide enchants with a viewers: 16 meters high above the walking artist, a trainer of 10 lions in a cage, hair-raising stunts, world-renowned Italian composer clowns, hilarious horse show, lions, camels, llamas, Grey and Scottish beef. The sensation of the night will be for many grandparents seen this in the past as kids and kids of to-day an act to wider their eyes as to see the World Number 1 attraction in the CIRCUSLAND … „THE SHAVING ELEPHANT” . This act is kept from the golden age of Circusville, a real traditional act which is mostly missing in the Circus show of to-day. Mind you, being a volunteer for a shave you have to be brave person. Don’t give up the elephant won’t as well… enjoy the ride! At Balatonfüred (the Northern area at Lake Balaton) 35, Fürdő Rd. (along the side of the Annagora Aquapark . The visitors may see the Eötvös Cicus show. A great timeout for the kids, face painting and riding on the pony, having fun with Duda the clown. The Eötvös Circus singer, Fasy – Kratelly Josephine will be on stage. At Balatonlelle (the Southern area of Lake Balaton) at 297, Rákóczi Rd. the ground will be enchanted into a circus field. 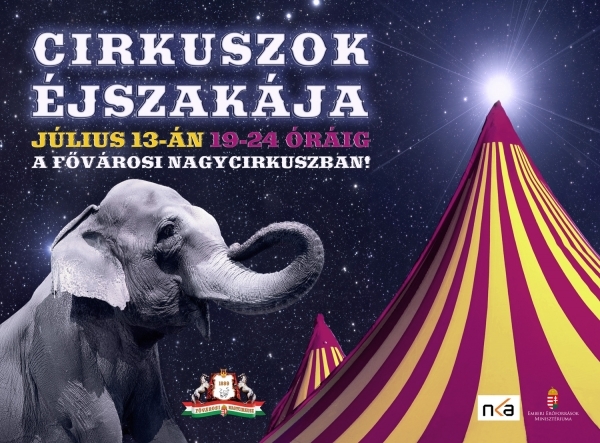 The „Circus Night” show will be worthy to visit for those circuslovers who don’t too often travel to Budapest to see the artists of the Hungarian National Circus. Just a hint of what will be going on. The guest artists from Spain Duo Alambria will be walking 16 meters high and on tip-toe on a connecting cable on marquee pillars. At Zamárdi (the Southern area of Lake Balaton) at the St. Stephen’s Road, the Military Park, the Florián Richter and his team of 50 artist will entertain and provide a memorable night for the audience. Beside the high starry sky, down here at Zamárdi the stars of highly appreciated horses will be galloping in the sand at the Horse Show. The Richter group in 2004 won the award-winning artist in riders and dancers at the Monte-Carlo Circus Festival of Gold and Silver Clown. It’s going to be the “CIRCUS NIGHT” all in capital letters … with the magic in the air bringing unforgettable sights-and-sound for the audience … so check your smarty pad, don’t miss to be there on the night like this at one of the scenes in Hungary.